Partner up with us. Become a Careington Affiliate! When you become an affiliate with Careington International Corporation, you're teaming up with one of the largest suppliers of dental, vision, health and lifestyle savings plans in the nation. Since 1979, we have been helping people save money on high-quality dental care, vision care and more. Our wellness solutions are the perfect complement to traditional health insurance and are an excellent option for those who are uninsured or under-insured. Become a Careington affiliate today to expand your business, earn more revenue and help people save. Contact us to learn how to become a Careington Affiliate! Whether it's monetizing website traffic, driving more sales or finding more customers, we understand that our clients' goals are our goals. Learn why affiliate marketing is critical in today's marketplace and listen to top advertisers and publishers discuss the results they've seen running their pay-for-performance programs on the CJ Network. Dedicated to improving the health and well-being of individuals, Careington International Corporation's health and wellness solutions are designed to complement traditional health insurance and provide significant savings for under-insured or uninsured individuals. Careington combines its flagship non-insurance discount plans with insurance plans administered through its affiliate, Careington BenefitSolutions, to create cost-effective solutions that improve the affordability and accessibility of quality health care. This is awesome for people who are self employed and don't have dental coverage through a job. We paid the annual fee for a family plan and in one root canal saved more than what the whole year cost! Thanks so much for a great plan. I recommended the Careington Dental Discount Plan to my friends and will continue to do so. 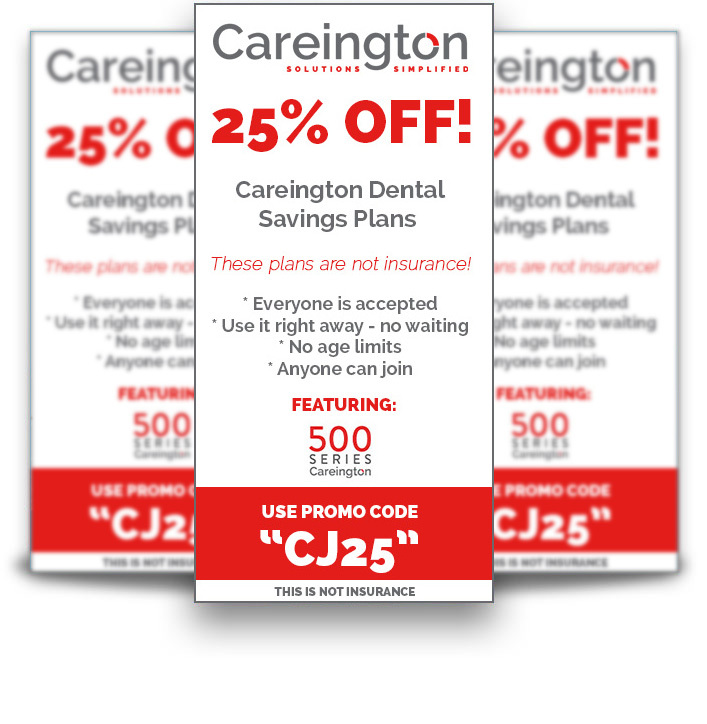 I had two teeth extracted and saved nearly $100 by using my Careington plan. I also recently changed jobs and this was the only benefit I did not have to worry about. The Careington service is wonderful. I had a partial made and saved at least 50 percent! I have recommended the plan to my friends and family. I also cannot say enough about the good dentists on the plan. Our marketing materials are designed to sell!